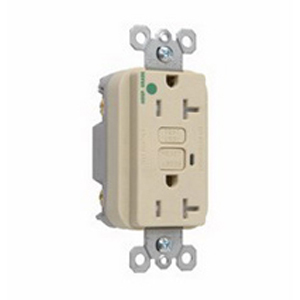 Detailed Description: Pass & Seymour Hospital grade, Ground fault circuit interrupter, receptacle in ivory color features high quality thermoplastic construction for added durability or strength. The 2-Pole tamper resistant receptacle has a voltage rating of 125 VAC. It offers patented SafeLock™ protection and has an automatic shutter system to provide more safety. Receptacle has a current rating of 20 Amps and features audible alarm to notify end user about the tripped ground fault circuit interrupter. It measures 1.720 Inch x 1.130 Inch x 4.200 Inch. Receptacle operates at a temperature range of -35 to 66 deg C and includes side/internal screw-pressure-plate with ground terminal back-wire clamp for easy installation. It has trip range of 5+1 milli-Amps, comes with two back-wire holes / termination to offer wiring flexibility and saves the box space. Device has a timing response of 0.025 second and is ideal for commercial or residential applications. Receptacle is UL943 and UL498 listed.